Mildred Marquise Hitt Henley, 92, passed away Thursday, January 10, 2019, at her home in Radford. 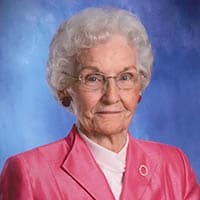 She was a member of Gethsemane Baptist Church and retired from Bayer Laboratory. She was preceded in death by her parents, Henry and Bertha Hitt; husband, William Sterley Henley; son, Donald W. Henley; and son-in-law, Dr. William D. Bishop. Survivors include her daughter, Beverly H. Bishop of Radford; grandchildren, Donald Henley, Jr., Robin Duty, Deborah Jefferson, and Michael Bishop; great grandchildren, Kyle Mason, Brittany Mason, Luke Henley, Ben Jefferson, Celia Jefferson, Ian Jefferson and Grady Bishop; great great grandchildren, Hensley and Aubrey; and many other relatives and friends. The family will receive friends from 11:30 a.m. until 1 p.m. on Wednesday, January 16, 2019 at the Mullins Funeral Home in Radford. Funeral services will begin at 1 p.m. with Pastor Jerry Gibson officiating. Interment will be private. In lieu of flowers, the family requests that contributions be made to Gethsemane Baptist Church. The Henley family is in the care of Mullins Funeral Home & Crematory in Radford.